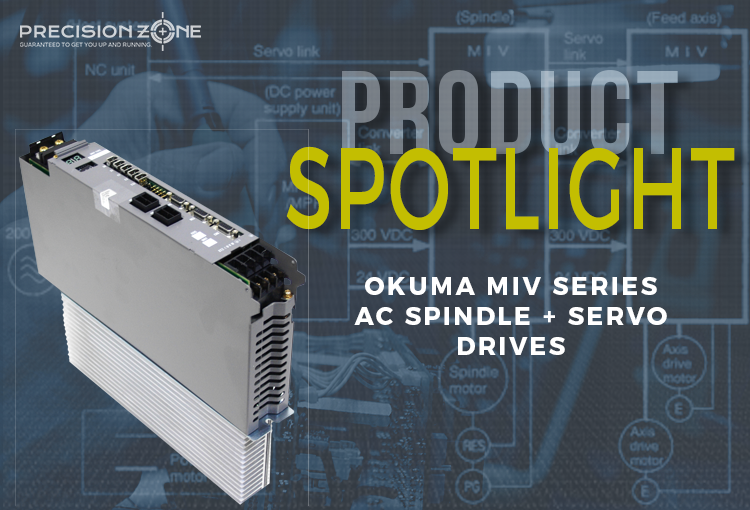 This month, we dive deeper into one of the AC spindle series we often work on that’s offered by Okuma – the MIV inverter spindle series. A configuration example for this series can be found below. This series offers a few different capacity variations, ranging anywhere from 1.0kW and going upwards of 45kW. 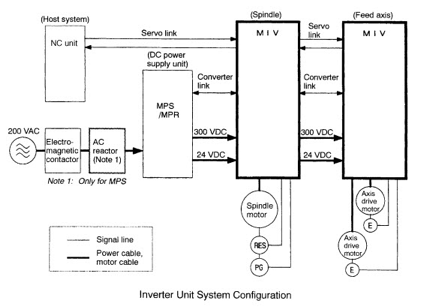 A DC power supply is required, as shown below, to supply the MIV spindle unit with appropriate 300VDC and the 24VDC used for control. Along with being able to be used in a spindle application, the MIV series is capable as also working as an axis drive. There are single motor and dual motor drive options, which can be easily identified based on the model number. An example model of a single motor axis drive would be MIV04-1-B1 whereas a dual axis model would be MIV0404-1-B1, where there is an additional ‘04’ or whichever capacity that axis is for the unit. An example spindle model would be MIV04-3-V3, where the ‘-3-‘ in the middle references a spindle style PCB and ‘–V’ at the end is to be used with VAC series of spindle motors. Two 7-segment displays can be found on the front of these units and have two operating modes – normal operation mode and alarm status mode. When any type of error occurs the display will alternate between either “EL” for exceptions, “AL” for alarms, or “UL” for warnings, then show the corresponding error code. If using a two-axis unit, these initial codes denote which axis the error occurred, so “AL” for alarm on the L axis or AH if it occurred on the M-axis. As with most units being used in this type of application, overcurrent is one of the most common alarms that we see within this series. This will be shown on the drive as ‘AL’ or ‘AH’ followed by ‘04’ and repeat that cycle or by an exception, ‘EL’ or ‘EH’ followed by ‘14’. When this error occurs, it is recommended to note when the issue came up – during acceleration, deceleration, constant speed, power up, etc. When a megohmmeter is accessible, that can be used to verify the integrity of the motor insulation and check if that is at fault for the alarm occurring. The motor power leads need to be disconnected from the drive to do this and can be checked through the cables to verify both the cables and motor insulation within one test. Following that test, with power off to the machine and the MIV drive unit, the drive can also be static checked using a digital multimeter with a diode checking function. While in this function, probing the negative lead to the positive bus and checking the output legs with the other lead will give a reading somewhere between 0.32V to 0.48V. This value will sometimes change based on the capacity, so the biggest concern is that each reading is within 10% from one another. Another common issue that is noticed with this series is alarm ‘17’ which is an error with the magnetic encoder. When possible, swapping the motor lead/encoder cables between two different drive units can help narrow down where the issue is stemming from. This error can occasionally be caused by a faulty control board, so if the encoder is able to be isolated and looks good, the drive would be recommended to get sent out for further evaluation and potentially repair. If any troubleshooting or technical support is needed feel free to contact us via phone at 800-551-4420 or email at repair@precisionzone.com to get in touch with our experienced tech support team.